President Barack Obama speaks during a news conference at the Nuclear Security Summit, April 1, 2016, in Washington. The leaders of more than 50 nations who met in Washington about nuclear security and terrorism agreed on the actions they will take together to reduce the risks facing the world, but President Barack Obama says the hard work starts now, building on the summit's accomplishments. The global effort to keep nuclear materials secure has made important progress, Obama told Americans Saturday. "As terrorists and criminal gangs look around for the deadly ingredients for a nuclear device, vast regions of the world are now off limits." Summarizing the summit, Obama said "no terrorist group has yet succeeded in obtaining a nuclear device or producing a dirty bomb using radioactive materials." However, he added that al-Qaida, Islamic State and other terror groups certainly have tried to do so. U.N. Secretary-General Ban Ki-moon, who was at the summit, "wholeheartedly" endorsed the communique and action plan agreed by the participants. He called on the entire world to sustain and build on the momentum the summit achieved, by "developing concrete recommendations on the nexus between nuclear terrorism and cyber security." Obama is following up the meetings on nuclear security with White House talks on Monday with NATO's secretary-general, Jens Stoltenberg. They will discuss the fight against Islamic State extremists and other terrorists, as well as the refugee crisis in Europe and plans for a NATO summit conference in Poland three months from now. The devastating attacks in Brussels on March 22 were not specifically aimed at NATO's headquarters there, but Islamic State's suicide-bomb assault on the city's airport and subway was a shock to the alliance, to the European Union and other international institutions based in the Belgian capital. 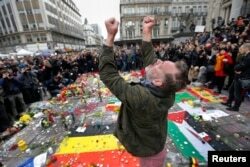 A man reacts at a street memorial following Tuesday's bomb attacks in Brussels, March 23, 2016. Despite the bloodshed in Western Europe, Islamic State "continues to lose ground" in Syria and Iraq, Obama said in his weekly address to the nation, broadcast Saturday from the hall where the summit took place. "Our coalition continues to take out [IS] leaders, including those planning terrorist attacks against our countries," the president said. "They're losing their oil infrastructure and revenues [and] their morale is suffering." Obama said he has invited all nations represented at the nuclear security summit to join the U.S. "in a broader discussion among our intelligence and security services, on how we can improve information sharing to prevent terrorist attacks." As Obama and Stoltenberg look at the effort to degrade and destroy the Islamic State group in Syria and Iraq, U.S. officials said they also will review NATO's efforts to control and alleviate the refugee crisis confronting Western Europe. Islamic State's savage tactics in the Syrian civil war - beheadings, torture and human trafficking in areas they control - have caused much of the refugee exodus in recent months. At the same time, the terror network also has infiltrated the massive tide of refugees, sending IS assassins into the West disguised as victims of war. During the two-day summit, leaders concentrated on both the need to reduce world stockpiles of nuclear materials as well as the particular risk that terror groups could acquire radioactive substances. "Working with other nations, we have removed or secured enough nuclear material for more than 150 nuclear materials," Obama said, adding that "this is material that will now never fall into the hands of terrorists." More than a dozen nations have disposed of their entire supplies of highly enriched uranium and plutonium — the radioactive elements necessary to build nuclear bombs, the president said, declaring this is "significant and meaningful" progress. Still, Obama noted, some countries' nuclear arsenals are expanding, and stocks of plutonium are growing. During six years of international meetings on nuclear security, which he initiated, the U.S. president said, "We’ve embraced a new type of thinking and a new type of action." "This is a perfect example of a 21st-century security challenge that no one nation can solve alone," Obama said at the summit's plenary session Friday. "It requires coalitions and sustained coordination across borders and institutions." He also met with a smaller gathering of the nations mostly closely involved in last year's nuclear agreement with Iran. Obama said that deal was "a substantial success ... focused on the dangers of nuclear proliferation in a real way." 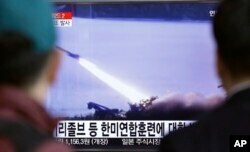 This year's nuclear security summit also focused on North Korea's nuclear-weapons development program. Obama met with leaders from South Korea and Japan about North Korea's provocative gestures and actions, and he also held a separate private meeting with Chinese President Xi Jinping, who said "We want to enhance communication and coordination on the Korean nuclear issue and other regional and global issues." The U.S. and other world powers may be experiencing a heightened sense of urgency in securing nuclear material and sites from terrorists following the March 22 attacks in Brussels, and subsequent reports that IS members also were plotting to gain information about a Belgian nuclear facility. World leaders also are concerned about the security of nuclear materials and facilities in countries such as nuclear armed Pakistan, where a terrorist attack in Lahore last Sunday killed more than 70 people, many of them Christians celebrating the Easter holiday. VOA White House correspondent Mary Alice Salinas, Katherine Gypson, Kenneth Schwartz and Li Bao of VOA's Mandarin Service contributed to this report.